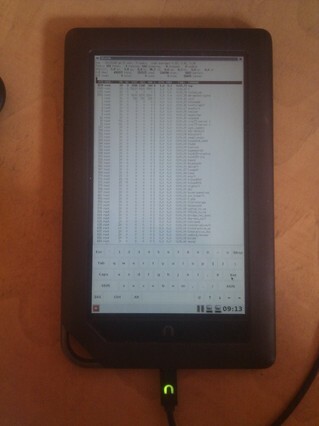 I have been toying around with idea of having real Linux stack (X11 and friends) on Nook Color. While this seems like a silly thing to do, it does allow me to use x2x and transfer keyboard and mouse from my laptop to tablet which is handy. If also allows me to run X11 applications on tablet screen using DISPLAY=nook.lan:0. I was fortunate enough to find blog post how to run Linux framebuffer X server on Android but I wanted to use touchscreen so I decided to write my own xorg.conf (this brings back memories...). If you want to know more about Emdebian hop over to DebConf 12: Integrating Emdebian into Debian [video]. I decided to use matchbox, mostly becuase it's only window manager which comes with on-screen keyboard which is useful on touch screen device. This will map all hardware keys and use mutitouch driver for screen. To make it work, I used evtest package which allows you to see events from input devices so you will know which device produce keyboard events and which produce multitouch events. To be honest, this solution isn't prefect, because screen behaves like touchpad, so you can't just point to screen and expect your cursor to just to that position. Following video shows X server in action. xf86-video-omap is newer implementation, but this requires 3.3 kernel and is not yet stable.